Popularly known as the jewel of the Ayung River, Permata Ayung Private Estate harnesses the energy from the land and the positive vibes from the river to create a harmonic and magical atmosphere. Most of the buildings at the estate are wood and have been purchased from local artisans. It also boasts a Java-stoned like pool with jets and overlooks the green rice terraces. It hosts its own temple where daily offerings are made. With its very own organic garden, The Restaurant is a sweet part of the Permata Ayung experience. Being the epitome of seclusion, it is perfect for a private getaway. Bali is a spiritual place and religion is observed every day. The estate has its own temple, according to Balinese custom and offerings are made daily. Blessed during a traditional ceremony by a Balinese high priest, the temple is an integral part of the estate . A team of professional chefs create gourmet menus throughout the day at the estate’s private kitchen. From beautiful, tropical breakfasts to healthy lunches and delectable dinners, most of the produce is grown on the estate with a nod to fine dining. The chef will entertain your personal requests as well, in case of any dietary restrictions. The estate is sustainable in every way, from its own organic farm that also raises fresh water prawns and lobsters to a whole range of tropical fruits and organic vegetables that are beautifully transformed daily in the gourmet kitchen. Connected to the master house by an underground tunnel with a second garden entrance, the Bulldog Bar revives the spirit of the legendary bars of Amsterdam. This unique bar personalises celebration with its custom-made wallpaper and personal photos. 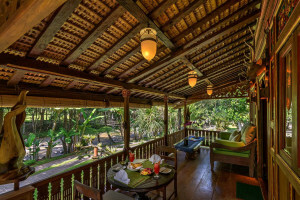 The teak bar with its antique carved liquor cabinet is a great place to congregate with fellow guests while the terrace offers serene river and field views. An adjoining cinema room is a great respite with its deep coloured sofas and restful atmosphere. 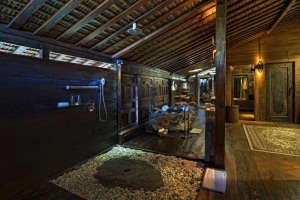 An exclusive private spa, designed by Mrs. Elora Hardy, is set beside the gurgling Ayung river. The complete Bamboo structure allows the sound of water to echo and surround you, a captivating sensory effect that soothes the mind. 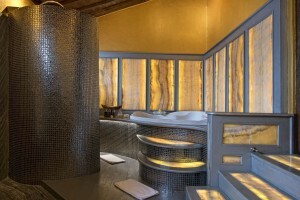 The Bamboo Spa features a steam room, outdoor tubs and showers as it rises over the encompassing trees. 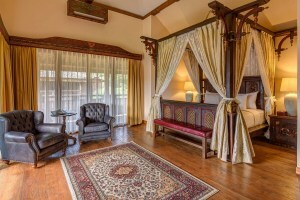 Offering both single and double massage rooms, it offers signature organic treatments by trained therapists. Two natural stone pools and the river allow the land to harness positive spiritual energies that will complete your cleanse. Book your session in advance as the spa is usually in high demand. By the spa, cocooned amidst the gardens, this air conditioned fitness center offers views of the flowing Ayung river. It is fitted with life fitness machines and weights along with adjoining changing rooms. As an antidote to the hustle of our lives, yoga and meditation sessions are offered in some of the beautiful locations of the property. 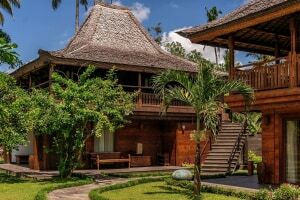 The retreat for children and young adults is situated close to the dining joglo and the pool. With its own kitchen for snacks and small meals, it is comprised of two antique lumbungs, rice barns, each with a twin suite at the top and bales below for relaxing by day. Walks throughout the grounds offer a chance to experience the beauty of Bali, it’s rivers, rice fields and tropical gardens. Natural pools are set on the riverside and a bamboo bridge connects the property to the rice fields beyond. One with nature, The Deck offers an exclusive seating enveloped by the flourishing gardens and tall coconut trees, with the Ayung river beside it. The soothing sound of the flowing river accompanies your meal as you dine, or indulge in some wine tasting from the well stocked premium wine options. This is a special dining experience for two that needs to be booked in advance. It's an adult only resort and highly recommended for couples for the exclusivity it offers. The hotel only welcomes guest aged above 12. There is no capacity for cots or extra beds in the room.